We are all familiar with the range of schools available today, but from the 1860s there were schools set up in Sydney for destitute children in order to provide basic education and religious or moral instruction. These were the Ragged Schools, based on similar schools of the same name in the United Kingdom. The Ragged and Industrial School movement sought to reform and improve the poorest section in society, and its schools provided a mixture of elementary education and industrial training. No charge was levied for attendance at a Ragged School. 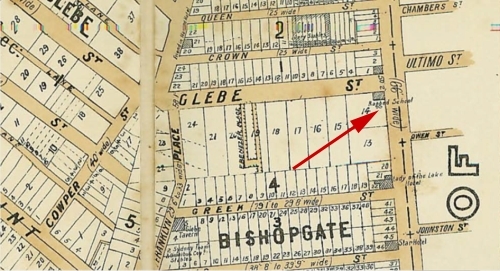 The Glebe Ragged School opened on July 21 1862, and was originally located on the corner of Glebe and Bay Sts. Another similar school, the Glebe National School, had opened earlier on April 8, 1862. The Ragged School can just be made out where the arrow is pointing. Some philanthropic Glebe citizens had seen a need for the poor children of the area to have some schooling. 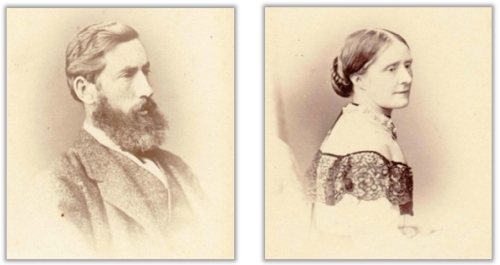 Among those citizens was Ann Goodlet, and her husband the timber merchant John Hay Goodlet. He knew that there were numbers of respectable men and women in this colony who owed their present positions to the action of the ragged schools … He was sure that if the Bible was not made use of, the schools would cease to be the power of good which they were. SMH, September 28, 1886. The Glebe ‘Ragged School’ was initially independent of other Sydney ragged schools which were organised by Edward Joy, but after 18 months the Glebe school’s organisers decided to amalgamate with Joy’s organisation. Over 100 students attended the Ragged School, although attendance was reported to be erratic as parents kept children home to perform chores or to care for younger siblings. Especially in winter, illness was a significant cause of absenteeism as measles and whooping cough were rife. The Ragged School in Glebe moved from its original premises to a new building in Water St (now Wentworth St) in 1896, where it remained until it closed in 1927. In the section on ‘ History of government schools’ in the NSW government Department of Education web site, it states that from 1848 until all school fees were abolished in 1925, parents and guardians in financial difficulty were exempt from paying school fees. The Public Instruction Act 1880 reduced primary school fees to 3 pence per child per week, to a maximum of 1 shilling per family per week, and the Board of National Education recommended that school fees should range from 1 penny to 1 shilling per child per week, and that local school boards were to set the rate. However, there is commentary of that time to the effect that some poor parents could not afford to send their children to the public Primary School. In 1900 there were 130 students at the Glebe Ragged School and the annual report of the Sydney Ragged Schools spoke of children running wild in the streets. The report commented on the necessity of this kind of school and referred to strata of society where the parents were so poor for a variety of reasons that the children had no clothes that would permit them to attend the regular primary school. A feature of the Ragged Schools became their provision of cooked meals which were at times extended to the parents of the students. An underlying facet of the Ragged Schools movement was the provision of Protestant religious education to all who came within the schools’ walls. Teachers were also extensively involved in outreach and wrote movingly about the poverty they encountered. They recorded the widespread effects of alcoholism, even to the extent that the children’s clothes, what little they had, would be pawned. As seriously sub-standard accommodation was demolished, families were moved and this was one factor in the declining enrolments in ragged schools. Note: Information was drawn from notes and other items by Lyn Collingwood, Eureka Henrich and Max Solling, and from Trove.